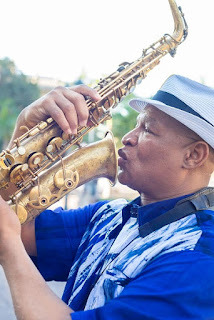 The Centre for Jazz and Popular music will present Soweto Exchange, a Sonic Jazz Hip-Hop Experience (USA/SA) led by USA saxophonist, Ernest Dawkins on February 6, 2019. This hip collaboration of musicians from Englewood, Chicago, will be accompanied by some of South Africa’s finest musicians. Distinguished saxophonist and cultural stalwart Ernest Dawkins, and a selection of colourful artists will be creating and performing original music together, that promises to be genre defying, and familiarly jazzy all at once. A live coming-together of beats bop and booming vibes; inspired by the beloved Soweto. This ensemble includes pianist Alexis Lombre and drummer Jeremiah Collier both from Chicago and trumpeter Thabo Sikhakhane from KZN. Ernest Dawkins - Saxophone - (Artistic Director) is a distinguished educator and founder of non-profit organisation "Live the Spirit". He is also one of the world’s premiere saxophonists and composers. He is an entrepreneur with years of experience working with new media technologies to produce and promote his work and that of the jazz community online and in digital venues. This stalwart of Chicago culture has well-established roots and relationships within the South African jazz fraternity, and proudly cites the late Zim Ngqawana and Feya Faku as some of his most cherished musical brothers. Alexis Lombre (piano) is a young professional jazz pianist who is making her way onto the jazz scene. She is currently studying at the University of Michigan under the tutelage of Grammy-winning Robert Hurst. Raised on Chicago’s South Side, she discovered early that the true essence of music is not only about what you hear but, more importantly how music makes you feel. She believes that her musical mission is to keep the ‘Soul’ in music alive. Jeremiah Collier (drums) is a meticulous jazz drummer hailing from Chicago, whose undeniable talents have been nurtured by fellow Chicago native Ernest Dawkins. The adolescent Colliers' stand-out gift saw him handpicked by the Thelonious Monk Institute as one of several music students from public performing arts high schools, who would present Jazz centred talks and perform in other cities as part of the institutes 2018. Brother El (DJ) is a multidisciplinary artist who uses music and visual arts to express ideas and connect people to a higher plane of consciousness. His performances often display several of his skills such as DJ'ing and his live PA Electronic sets. His signature style is a complimentary mesh of Hip-Hop, Break Beat, Spoken word and Ambient House, to list a few. Artemis (EMCEE) is a Hip Hop's princess, is proving to be heir to a throne many lyricists have claimed in hiphop culture. Growing up in Chicago's South Shore community, she uses her street experience and knowledge mixed with revolutionary fight to broadcast struggles in her neighbourhood. Poetry was always her escape from the rest of the world but in 2011, Artemis then realized she had a gift of flowing her words melodically. This compelled her to open up her creative thoughts to incorporate hip hop into her life. Her punch lines and versatility contribute to her unique sound. Her influences include Jay-Z, Lauryn Hill, Outkast, Michael Jackson and Phenom, to name a few. Her style of music is often described by critics as being very lyrical. Artemis's ultimate goal is to be considered as one of the greatest of all time.